As the cooler temperatures of October approach the fever takes hold of almost every saltwater angler to start the hunt for those copper backed blue tailed beauties we know as Red Drum or Redfish. The cooling water temperatures trigger their need to feed and one of their foods of choice is the fiddler crab on the shallow flats in the low country. Redfish will come up on the flats by the hundreds gorging on fiddlers and that is where those anglers that choose to fish from a kayak gain an edge over all the other anglers on the water. The average kayak can move in less than 6 inches of water and get on to the flats even during low tides when you can’t get to them by boat or on foot. Redfish can be skittish at times when they get into those shallow flats because the normal cover they retreat to in deeper water is not there. No worries though if you are in a kayak, you can slowly, stealthily paddle onto and around the flats making little to no noise at all, like a hole in the water unnoticed by your wary prey. The biggest challenge to fishing for Reds is finding them; once you have them located you can offer a near smorgas-board of baits to entice a bite from a Red. 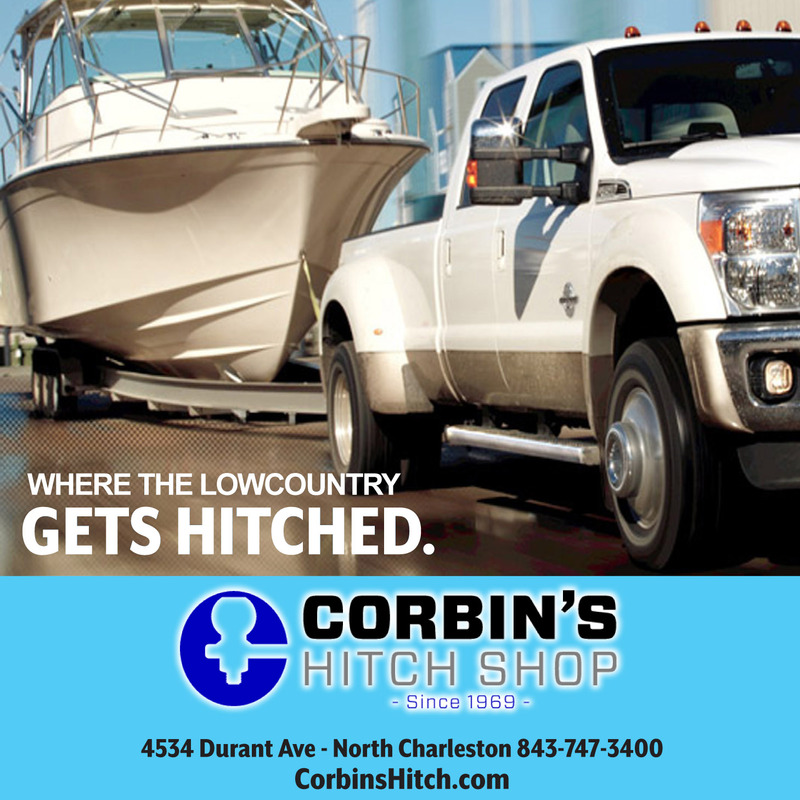 For artificial baits, soft plastics in shrimp and minnow patterns on jig-heads, Mirrodine spooks, Redfish Magics, and Yozuri twitch baits name just a view of the more popular local choices. The use of live and cut bait is another way to fish for Reds; a simple Carolina rig with cut bait or a popping cork with live shrimp or minnow should prove deadly. 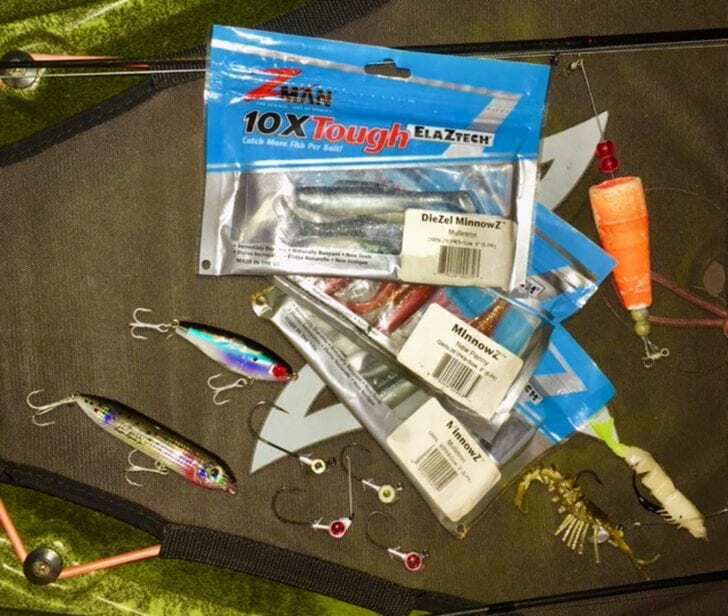 If you are going after your first Red in a kayak, keep the tools of your hunt simple; a 3000 series reel with 15-20# braid on a 7 ft med heavy rod coupled with a Berkley gulp shrimp on a simple jighead or a zman diesel minnow rigged weed-less will get the job done for you. The new weedless Trout Eye jigheads from Eye Strike Fishing are perfect for this situation. Unlike fishing from shore or a boat, in a kayak you don’t need to oversize your rod and reel choice because you and your kayak become part of drag system when fighting a good sized Red. 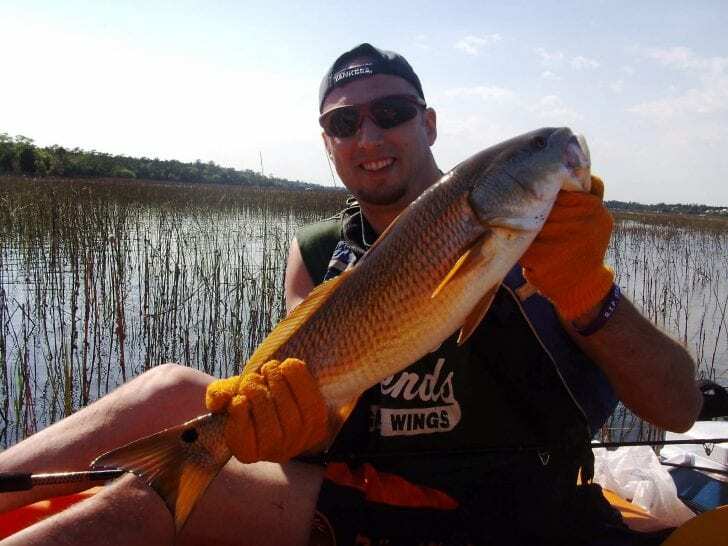 A big Red will give you a “sleigh ride” as yak anglers like to call it when a fish is big and strong enough to pull them around in their kayak. The flats are not the only spot that you will find Reds this time of the year but it is a spot that you in your kayak can fish without worrying about being waked or crowded out by powerboats, because they cannot reach you there. 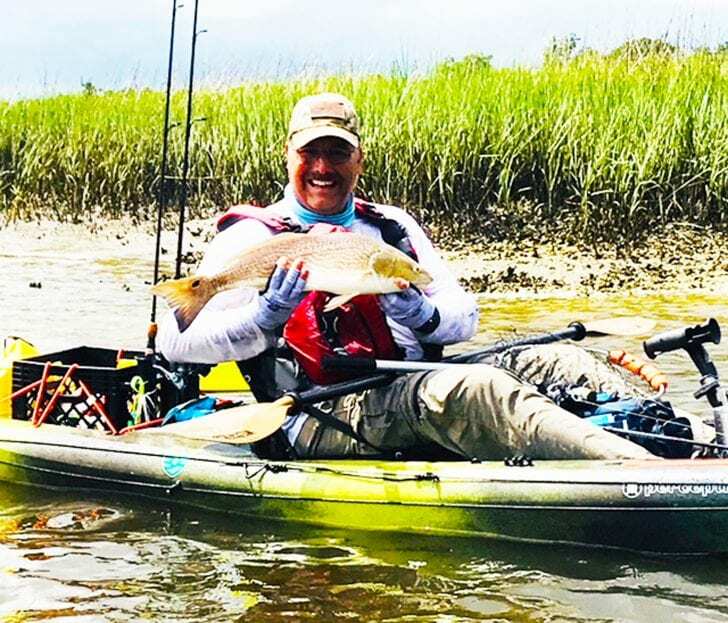 I look forward to seeing some great pictures of Red fish as they will be the Low Country Kayak Anglers AOY (Angler of the Year) species for the month of October.